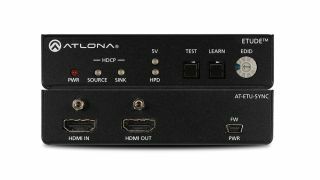 Atlona is now shipping the Etude Sync (AT-ETU-SYNC) EDID Emulator, addressing the increasing challenges systems design and integration firms face with solving audio and video format compatibility, signal integrity, and EDID communication in commercial and residential AV systems. The Etude Sync is the latest Atlona integration problem-solving device, replacing the popular AT-UHD-SYNC. It supports HDR (high dynamic range) video as well as 4K/UHD at 60 Hz with 4:4:4 chroma sampling. The compact solution provides EDID emulation and Hot Plug Detect communication between HDMI sink and source devices. In addition to addressing HDMI signal and device-related issues, the Etude Sync reports HDCP compliance at the source and sink, and supports HDMI 2.0 data rates up to 18 Gbps. It can manage EDID communication with the source by delivering EDID from the display or the Etude Sync’s internal memory. The Etude Sync is ideal for AV system troubleshooting as well as ensuring reliable, consistent performance. For convenience to installers and technicians in the field, the Etude Sync can be powered via USB by the included power supply, a laptop, or any available USB port nearby. The Etude Sync is now available for a suggested retail price of $249.99, and is protected by Atlona’s 10-year limited product warranty and customer support services. This ensures integrators can specify, purchase, and install the Etude Sync with confidence.